VOC (Volatile Organic Compounds) Catalyst is formed by the first carrier cordierite honeycomb ceramic,second carrier γ-Al2O3 and the active components noble metal Pd and Pt. VOC (Volatile Organic Compounds) Catalyst is formed by the first carrier cordierite honeycomb ceramic,second carrier γ-Al2O3 and the active components noble metal Pd and Pt. It is the new high efficient catalyst for VOC waste gas. a.Widely application- it can be applied to the industrial waste gas purification which mainly contains monoxide,hydrocarbon and related oxide ramification. b. Lower gas flowing resistance,lower initiative temperature for reaction,high active function,wide range for air speed. 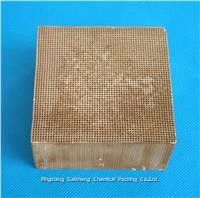 300 centigrade,it can achieved more than 98% purification efficiency. food,mechanical,instrument and meters.Household Appliances.Painting,Insulating material and colorful steel.